Shortly before Teach Them Diligently, I met a new friend: Jackie from The Freedom Girls. She and I tweeted and enjoyed getting to know one another. Once I arrived at the conference, I could not wait to meet her…. When I walked up to her table, I noticed something: she and her daughters were relaxed, comfortable, completely enjoying themselves together, at a table just being together. It was a beautiful site. I love seeing Moms and daughters getting along and not just ‘doing something’ but being together. While we chatted, I read through her pamphlets and a few pages in her book: The Story of Ruth Through a Child’s Eyes. I also spent a few moments holding her Ruth doll. (I’ll admit it, I still love dolls). All in all, I fell in love with Ruth and Jackie….and The Freedom Girls! I was so excited about a family with a purpose for play. 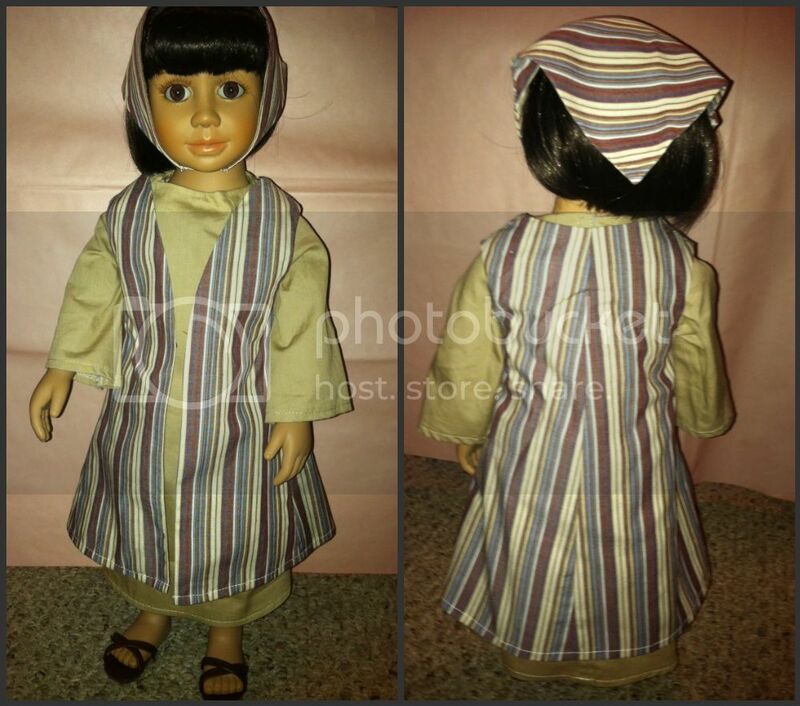 A purpose not to increase the vanity of a child, but to bring them to the love of Christ through stories…and a doll. And that purpose does not end with the child, but involves the parent. And we brought a Ruth doll and Book home. My daughter was so excited. I love that at 9, she still wants to play with dolls…and wants me to play with her. So, we drove home (she held the box the entire way) and when we arrived, she ran in the house, finished her chores and patiently waited while we unwrapped Ruth. Normally, I need my husband’s help to ‘get a toy out of the box.’ This time, I did not. When we opened the box, we saw a Re-Birth Certificate, the Book and then Ruth. 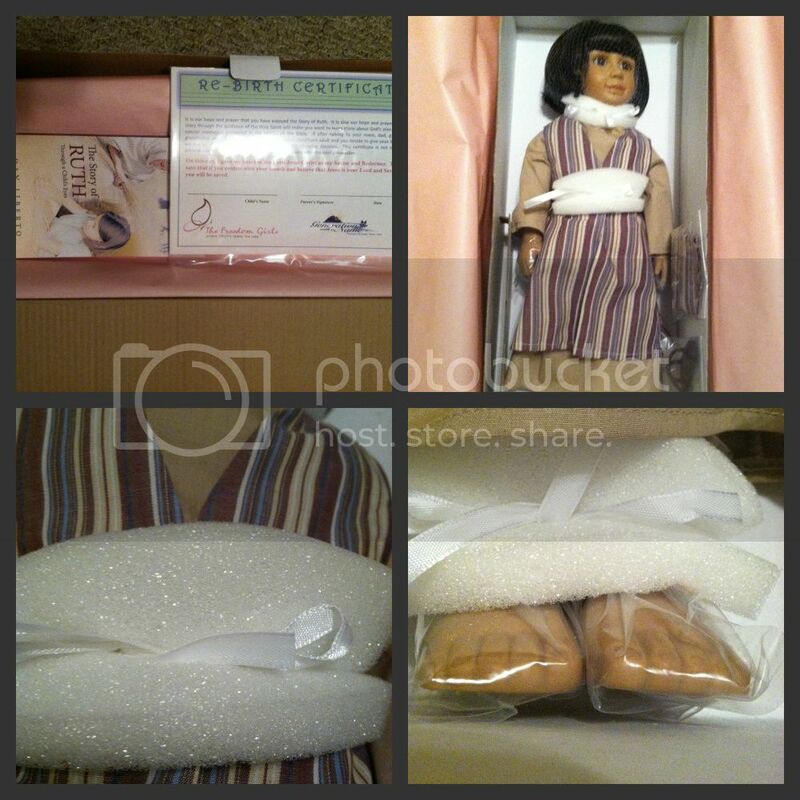 I was so delighted to see that she was not held in the box by metal twist ties, but, her neck, midsection and feet had a cushion with a silk string tied around it. Her head/hair had a fish net stocking to keep it in place and her hands/feet were covered with little plastic baggies (that were very easy to remove). As we took her out of the box, I saw a light shine in my daughter’s eyes. She took her shoes and head covering out of the bags that were securely taped in the box finished dressing her and stood her up. 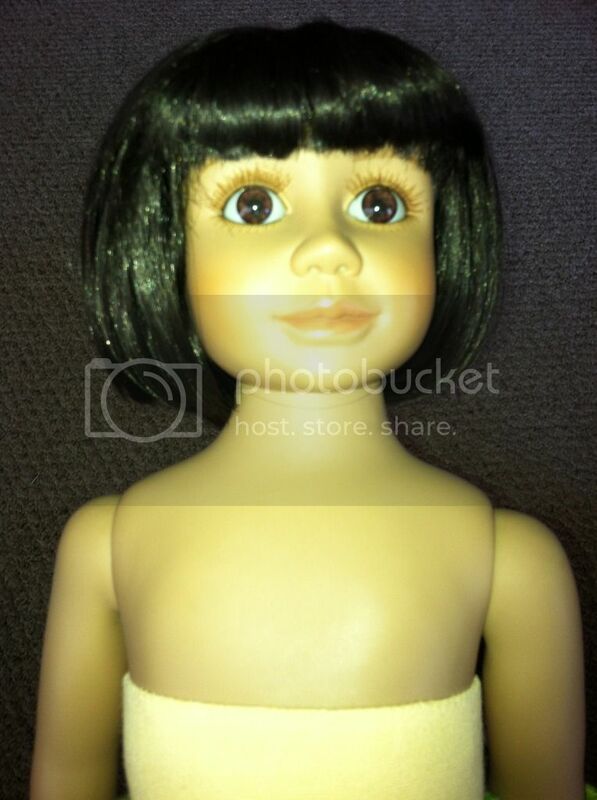 While a stand could be used with this doll, we found we did not need one. She stood (quite easily) on her own. This is family learning and discipleship at it’s finest. I love the way this book pulls out the heart issues we all deal with: sharing, loving, fighting, loyalty, integrity, anger and more. Yet, it is sweet, gentle…and those issues are addressed in God’s word. You see, as you read through this book, you are actually taking a deeper step/study into the story of Ruth. It is one of my favorite stories in the Bible. I hope you have enjoyed learning about Ruth and her book. We love having both in our home and I pray it will become a family heirloom that will be passed down to my Grandchildren (did I really just write that word?). Bt, that’s not for many many years! However, we, as parents need to realize, we are raising our children to be parents to our Grandchildren. We are passing on a legacy. This is definitely part of the legacy I want to pass along. One filled with opportunities to sit, play and grow with my children and grandchildren. What do you think? Do you think Ruth and her book would be a good addition to your home? 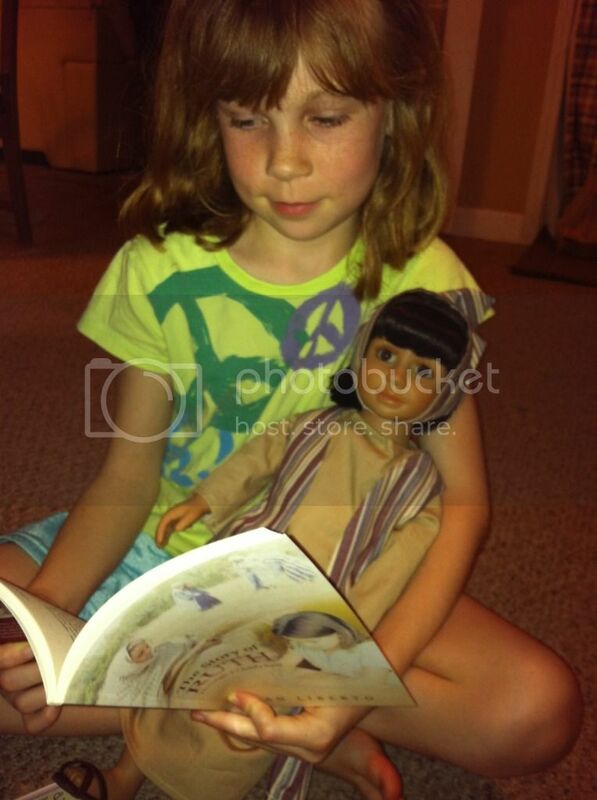 Dislcaimer: I received this doll and book for my honest opinion. No other compensation was received. Oh, I just love the doll! I have never heard of this doll or the Freedom Girls. Thank you for sharing with us! Joy-I had not heard of The Freedom Girls either-until earlier this year. The book and doll are really nice and a great price! Make sure you watch the video to find out how to enter to win one! I bet your God daughter would love it! Ruth is one of my favorite women from the Bible. Her story and the chapters dedicated to her are just amazing! I LOVE this concept and the ability to teach her values and lessons in a way that reaches out to young girls and is able to meet them on their level! Additonally being able to involve me as a parent? Total win!! Kerry, Thanks! Yes, we love Ruth!!! Such a beautiful way to share God’s word with girls…and Moms/Grandma’s!!! You’ve had some great posts this week for Easter – thank you for helping grow my homeschool! That is so cool. What a great doll. And the fact that your daughter is wanting to pick up a book and start reading it to you is awesome. Looks like a win win situation. Kim, the book has been such an amazing addition to our home library. Even the boys are enjoying it and I am learning so much about the book of Ruth….the historical context of the writing and the virtues/character teaching are beyond words!